This handsome table and bench set includes 1 rectangular table and 4 benches. 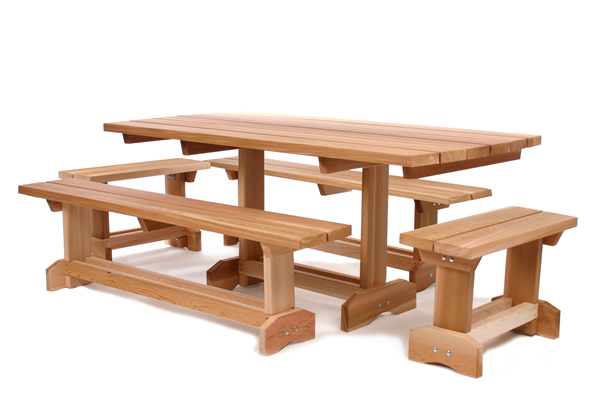 The set is finely crafted from Clear Grain Unfinished Western Red Cedar. Eloquent in shape and form, our carefully handcrafted Market Table Set shows nicely indoors or out. Western Red Cedar in its natural unfinished state has a richly textured tactile grain combined with a glowing palette of warm, mellow tones ranging from light amber to deep honey brown. 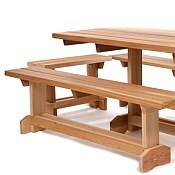 No man-made material can duplicate the depth of cedar's natural luster. Western Red Cedar remains subtly aromatic, and the characteristic fragrance of Red Cedar just adds another dimension to its universal appeal. Comes unassembled only!